You remember paper chains right? I certainly do, these used to be one of my favourite crafts when I was a child and no matter what the occasion I would try to bust out the paper chains to decorate up my bedroom with! Christmas time they were red and green and come halloween my paper chains were black! 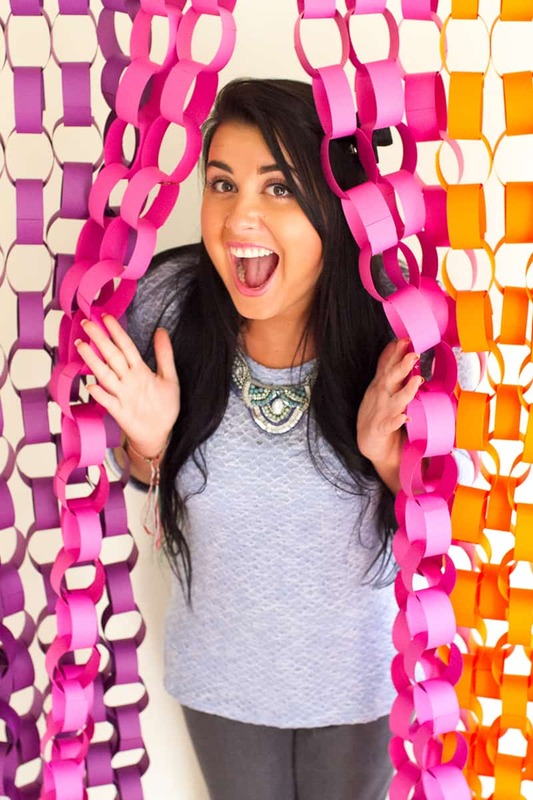 Well, it just so happens that paper chains make the most amazing back drops and they’re really really easy to make! We’d love to see an entire wall of paper chains, wouldn’t you? Step 2: Add your glue to one edge of the strip. Step 3: Then fold your strip back on itself to form the loop, hold in place to dry. Step 4: Repeat with your next strip but be sure to loop it through your first loop. Step 5: Continue to do this until your paper chain is the length you would like it and then repeat in all the other colours until all of your paper chains are done! Step 6: Finally thread the top loops of your chains onto your pole and you’re done! hey Jessica, Love your backdrop! I’m a huge fan of DIY. I’m already imagining doing this with gold, silver or other glitter type cardboard paper (maybe even in white too). A few years back, when we were planning out our wedding I decided to build my own photo booth for me and my guests. while I slaved away in the garage, my wife planned the entire wedding. Did I mention we did everything from A-Z in 3 Weeks? I think I lost 10 pounds that last week from not having any time to eat! Anyways, the photo booth turned out amazing! we didn’t’ have a nice backdrop like yours though (no time) but if I was to do it again, I would definitely think of yours.